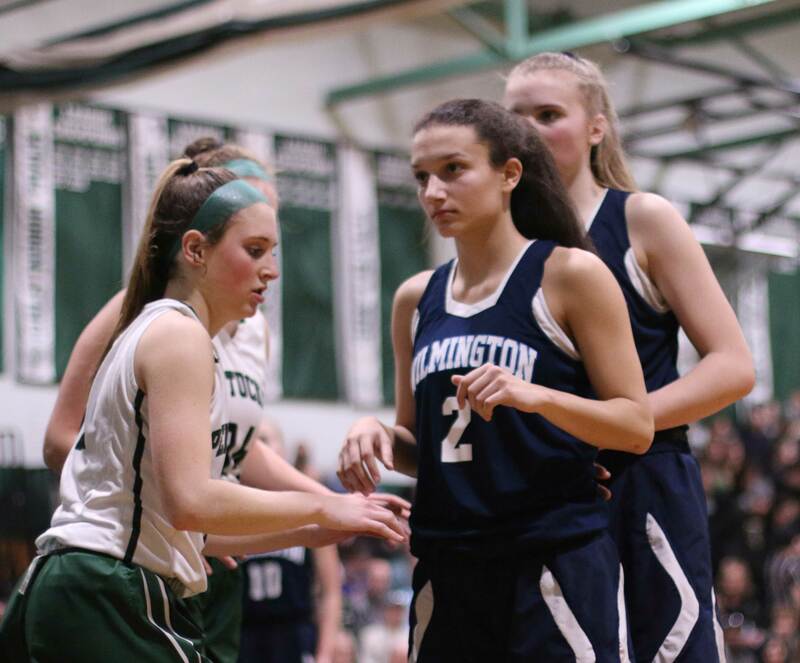 That was what Wilmington coach Jessica Robinson said after her Wildcats fell to Pentucket, 61-34, in the Division 2 North quarter-finals on Thursday night. The Sachems (20-3) move on to the semi-finals on Tuesday night against #4 Swampscott at Whittier. 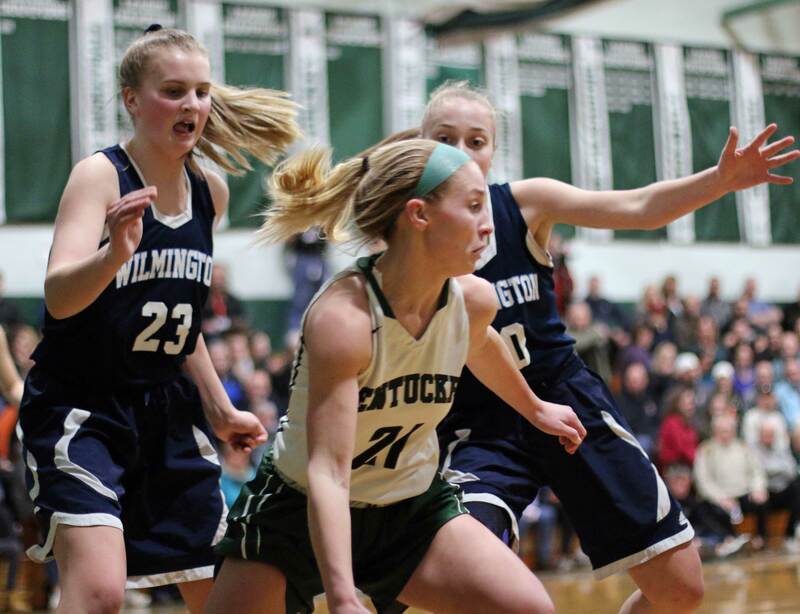 The top-seed hounded #8 Wilmington into twenty-five turnovers and kept the Wildcats from functioning smoothly on offense for much of the game. 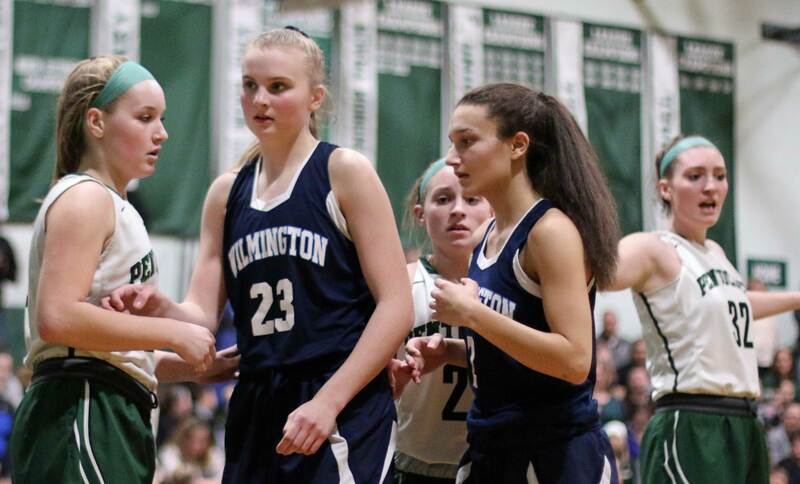 Jenna Tavanese (2) paced Wilmington with fifteen points. 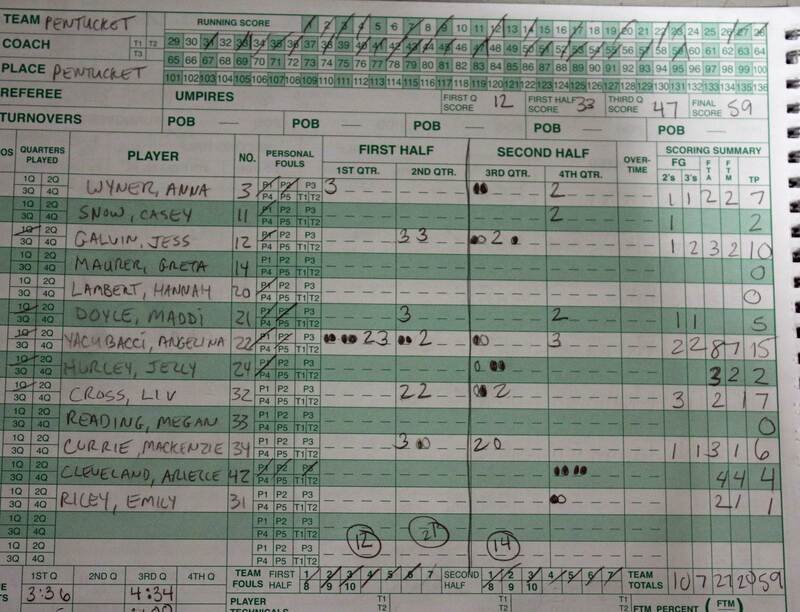 One of those players was junior Jenna Tavanese (15 points). 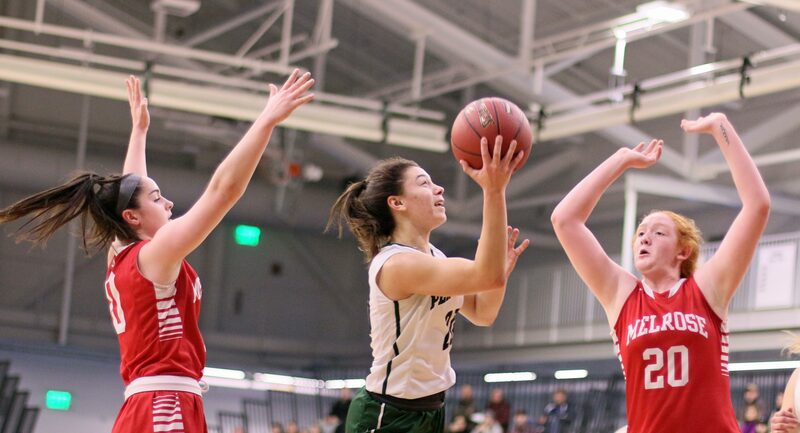 Jenna hit two 3’s and Olivia Almeida added another during 1 ½ minutes of the first quarter. That burst of great shooting propelled the visitors into a, 9-4, lead with three minutes left in that quarter. Sophomore Kylie DuCharme assisted in all three triples. Once the team from the Cape Ann League settled in, the Wildcats were in trouble. 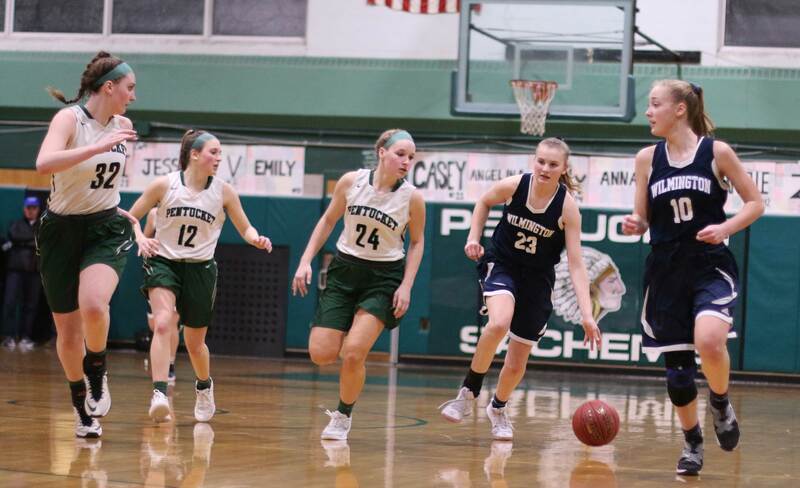 The Sachems trapping stymied the offensive flow of Wilmington and when Pentucket’s offense began to click, this game turned in their favor. 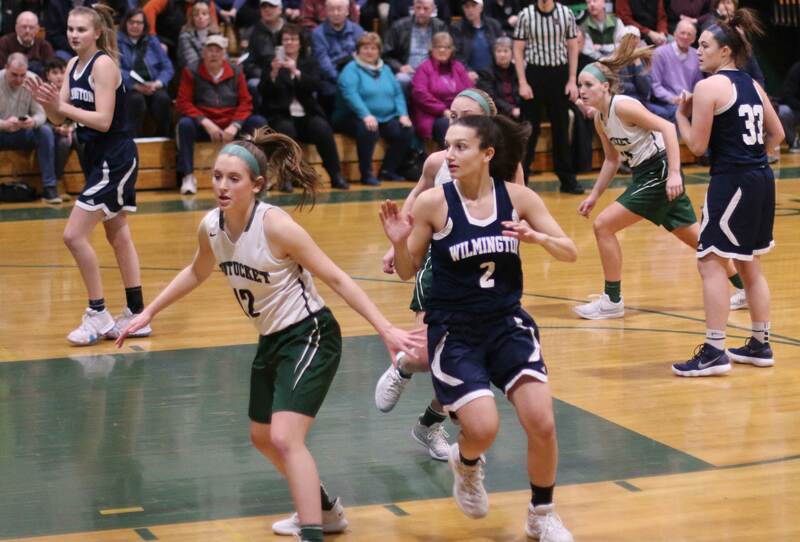 Pentucket answered the Wilmington 3’s with two of their own (Anna Wyner & Angelina Yacubacci) plus a layup from Angelina (17 points). The Sachems led 12-11 after one quarter. The home team took the lead for good early in the second quarter after Liv Cross converted a rebound and teammate Maddi Doyle drained a three. Up by two (17-15) three minutes into the 2nd quarter, the Sachems put a 10-2 segment together (featuring 3’s from MacKenzie Currie and Jess Galvin) and the spread rose to double digits (28-17). Pentucket led, 33-22 at the half. 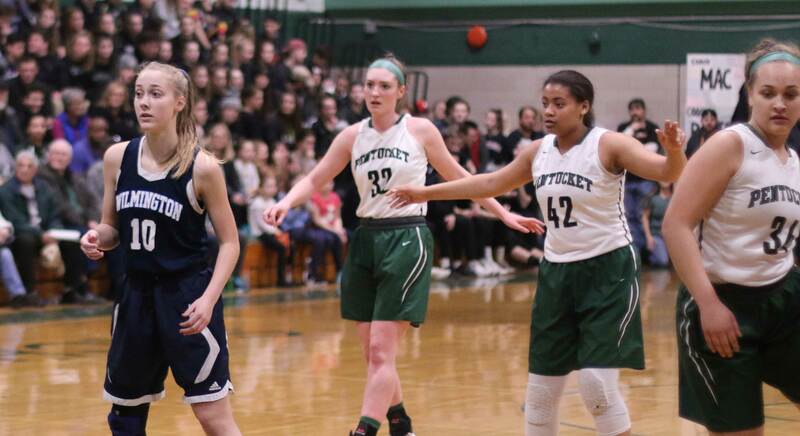 Credit the persistent Pentucket pressure with wearing down the team from the Middlesex League. 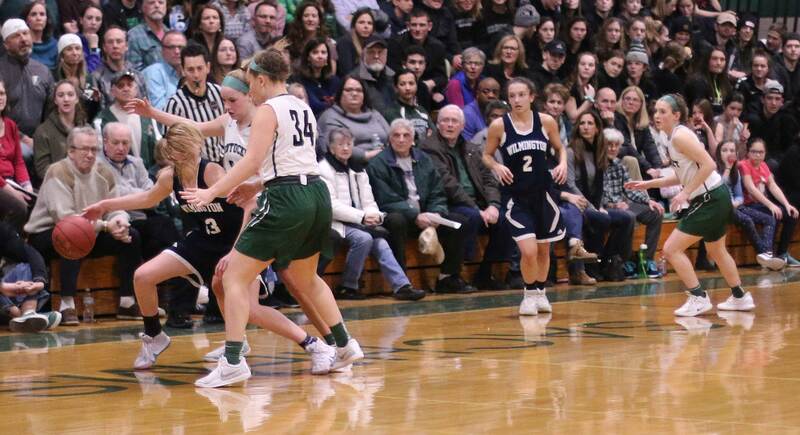 The Wildcats (12-9) were able to draw within ten (38-28) after Jenna Tavanese hit a three and made a free throw with 3:25 to go in the third quarter. Thereafter it was all Pentucket. 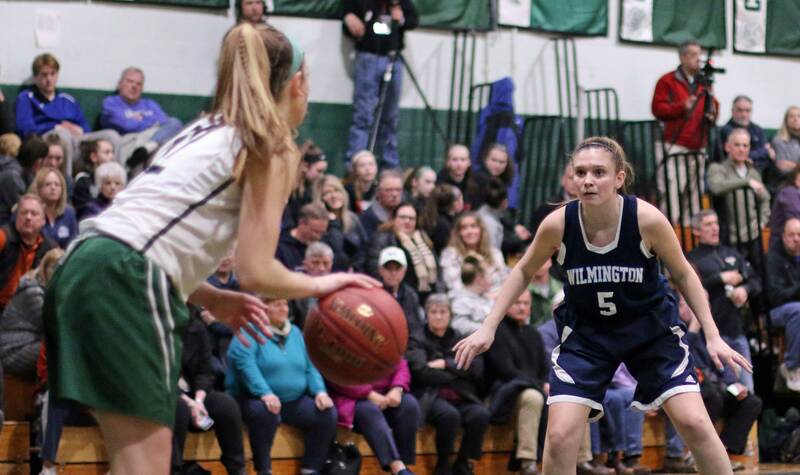 Wilmington scored two baskets in the last minute of the game. 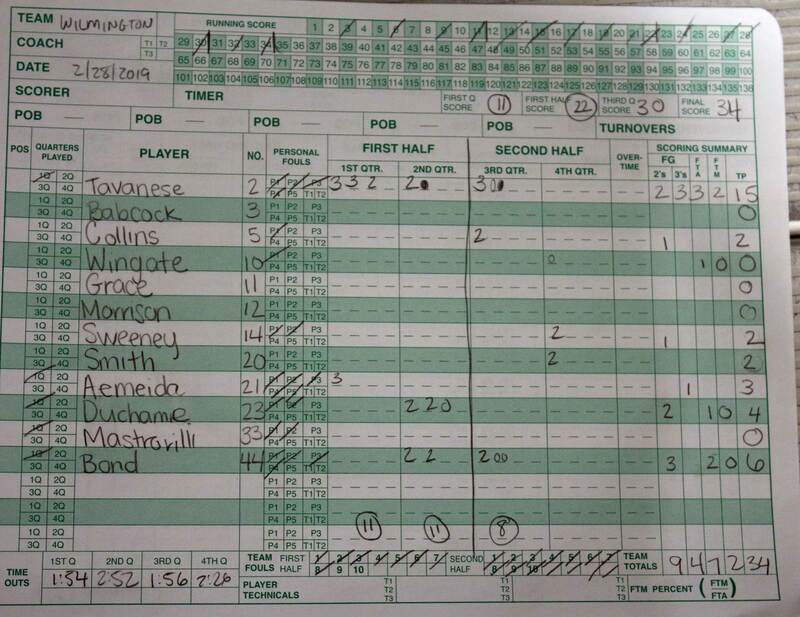 Other than that, the Sachems turned their ten-point lead (38-28) into a 59-30 spread. That’s a 21-2 segment! 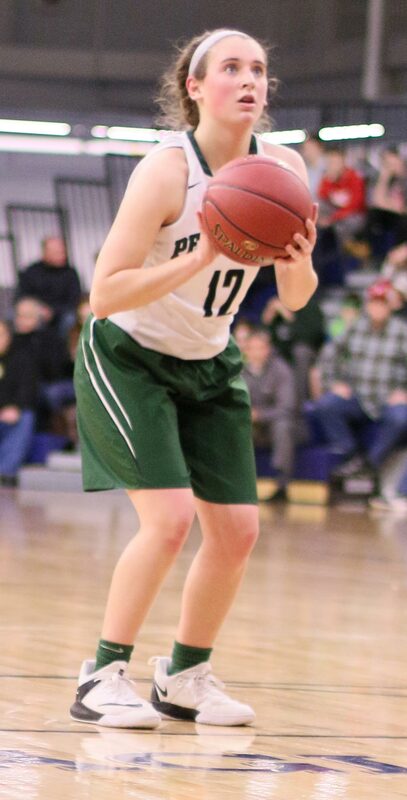 Jess Galvin (10 points) led the Pentucket surge. She had a beyond-the-arc three, an old-fashioned three, and a free throw. 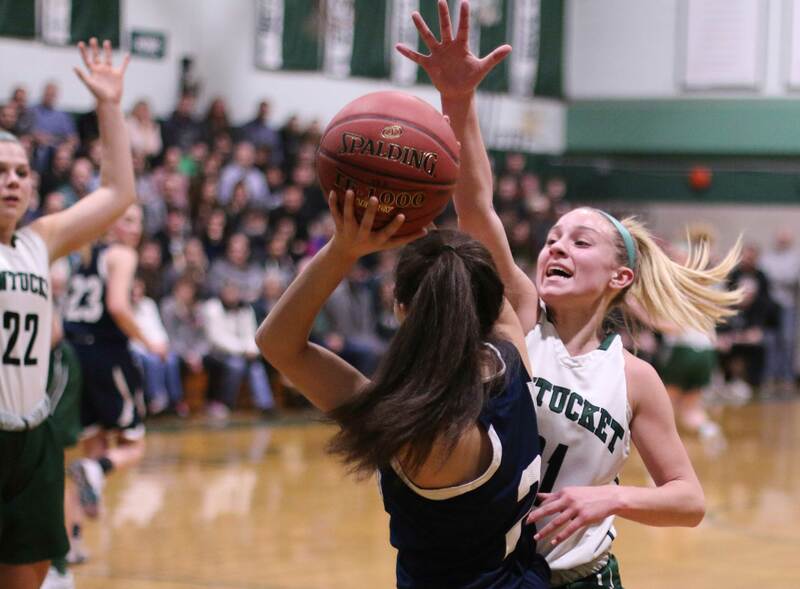 One of the key Pentucket defenders was junior Angelica Hurley. 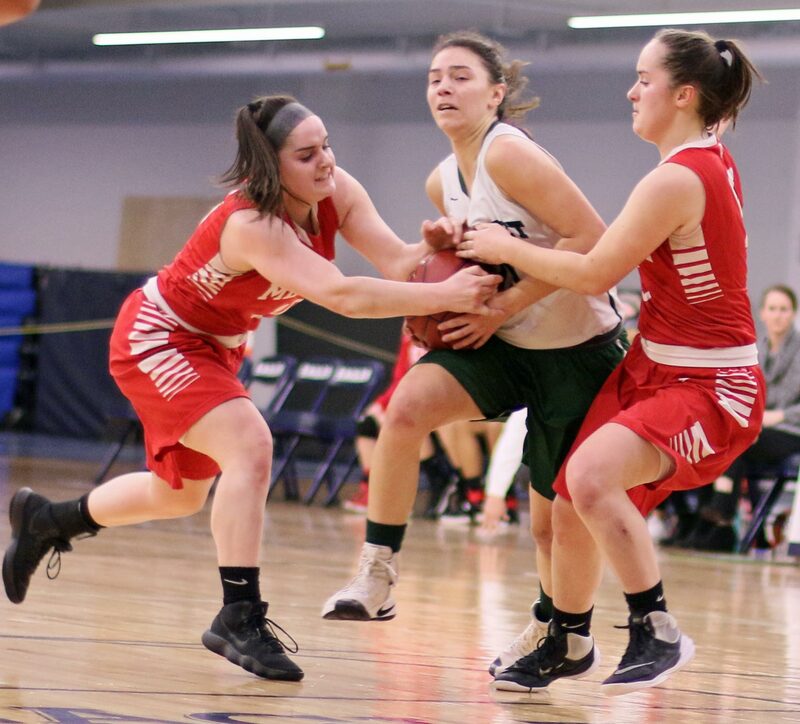 Angelica scored only two points but her defense on sophomore Kylie DuCharme (4 points) was significant. Former Sachem Tess Noguiera was in the house. She was part of the Pentucket state championship team in 2012. 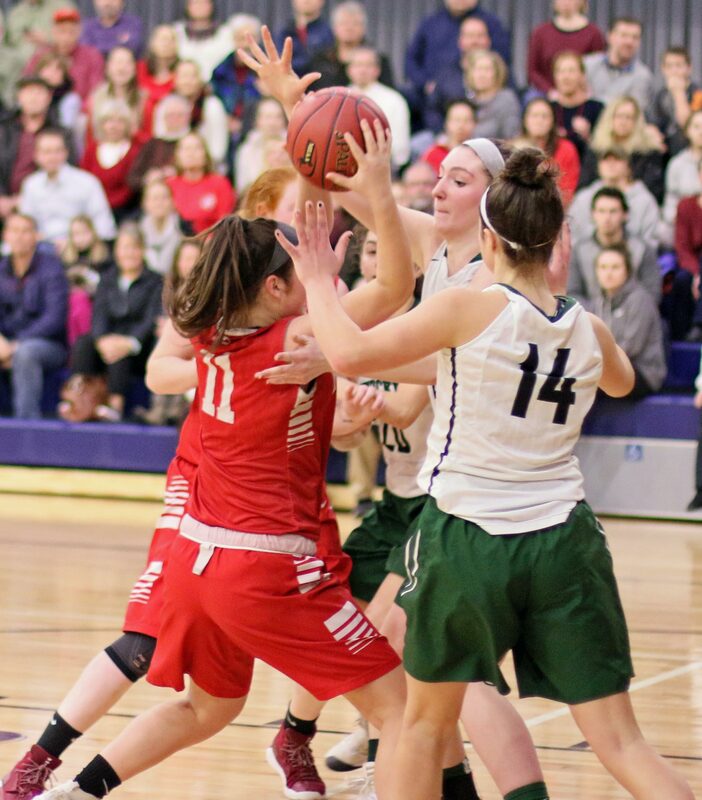 From Pentucket she went to WPI where she was also on a championship team. She now works at Raytheon. Good crowd. Bleachers were added to the bench side of the gym. 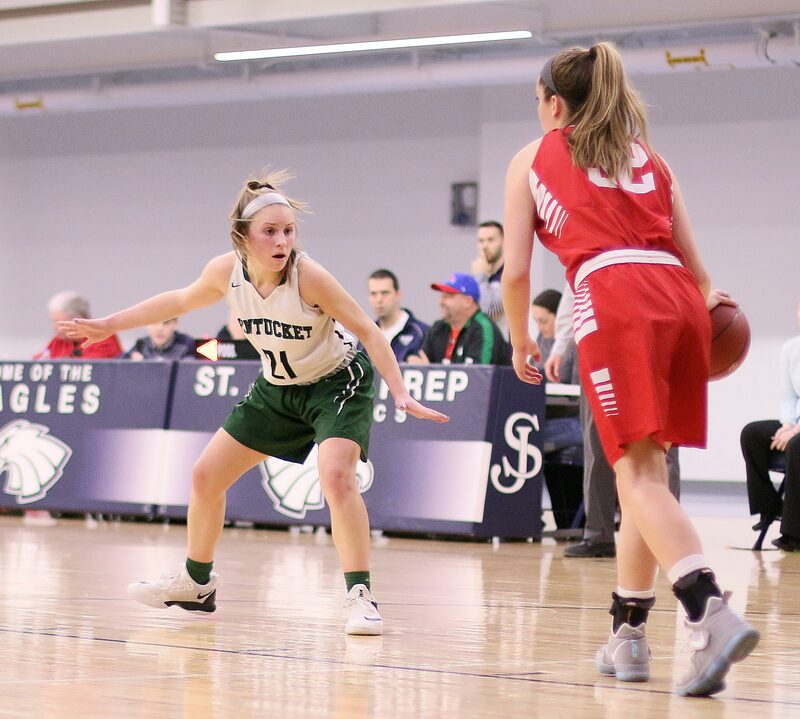 (Danvers MA) Pentucket dominated the beginning and the end defeating Melrose, 59-45, in the Division 2 North semi-finals on Thursday night at St. John’s Prep. The Sachems (22-2) take on Wakefield on Saturday (2PM) in the D2 North finals at the Tsongas Arena in Lowell. Melrose and Wakefield split in their two Middlesex League games this season. Pentucket ran and pressed Melrose into mistakes from the outset and had a 10-0 lead after 4 ½ minutes. What looked like a bad matchup early was anything but that as the game progressed. 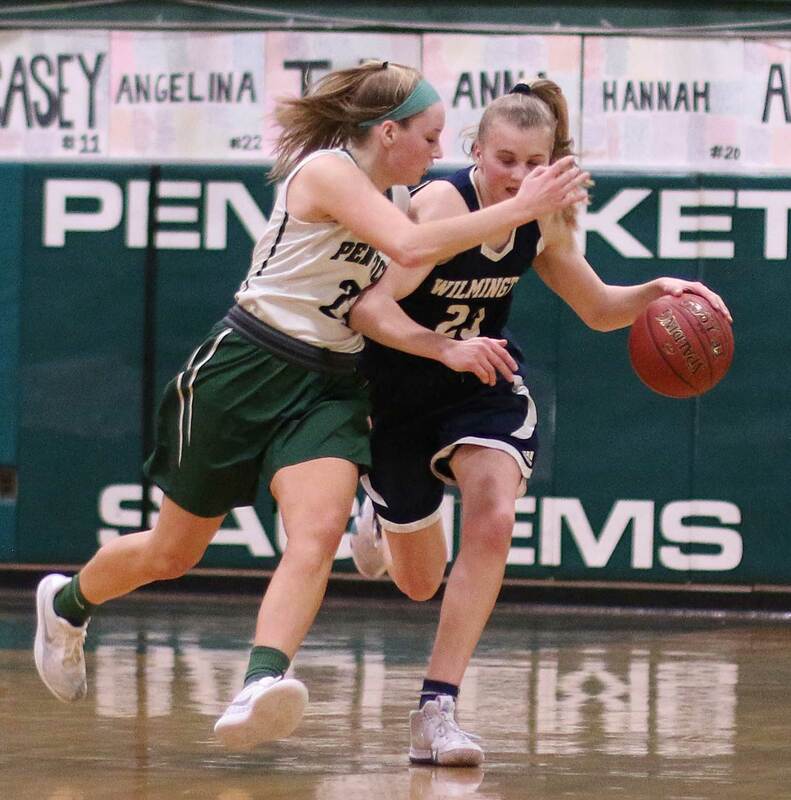 Pentucket still led by ten (22-12) with 1 ½ minute left in the first half before a three-minute, twelve-point surge gave the Lady Raiders (19-4) the lead, 24-22, early in the third quarter. During the run of good Melrose offense, Sam Smith’s big three ended the first half. 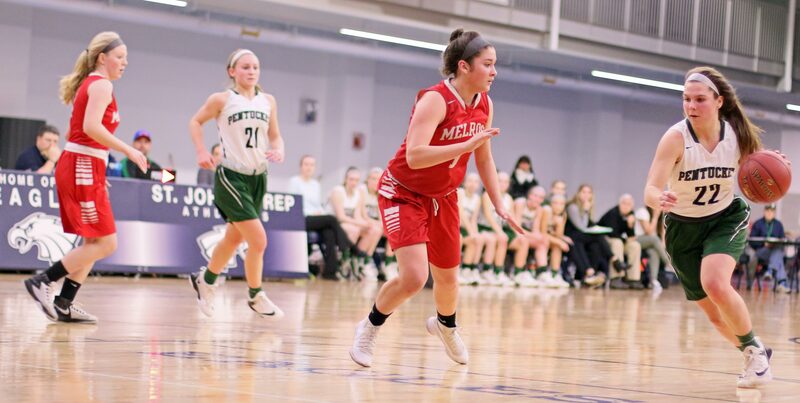 Lily Cunningham (13 points) continued the Melrose scoring with a full-court layup and free throw. Freshman Sam Dewey (17 points) finished the drive to the lead with a put-back. 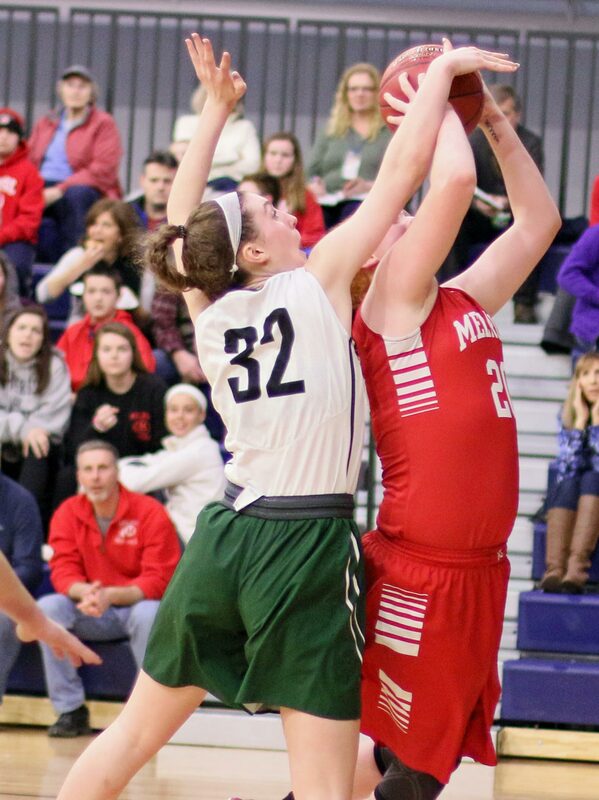 Liv Cross (10 points,10 rebounds) reignited the Pentucket offense with a rebound basket to tie things at 24-24. 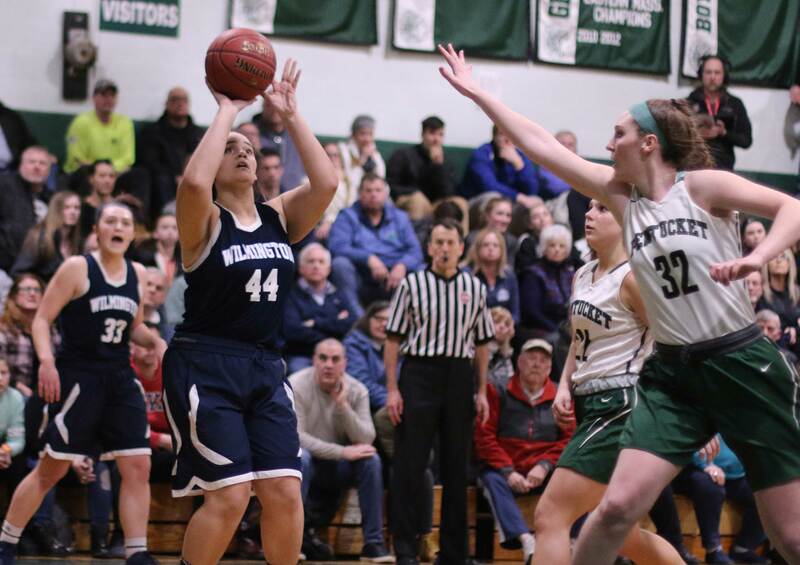 Angleina Yacubacci (10 points) followed with two free throws that gave the Sachems the lead for good with four minutes to go in the 3rd quarter. This game, however, was anything but settled. 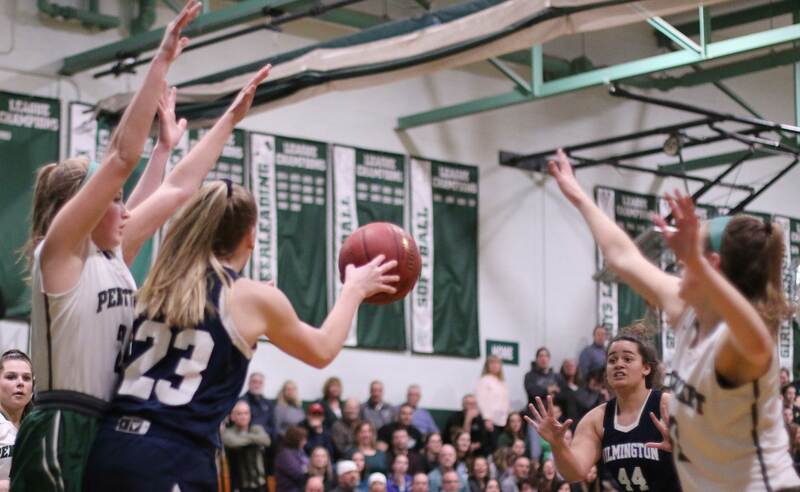 The Lady Raiders stayed within one or two possessions until the Sachems gained serious separation with a run of seven points early in the final quarter to pull up by ten, 46-36. That ten-point separation was just about as safe as that 10-0 lead at the start! 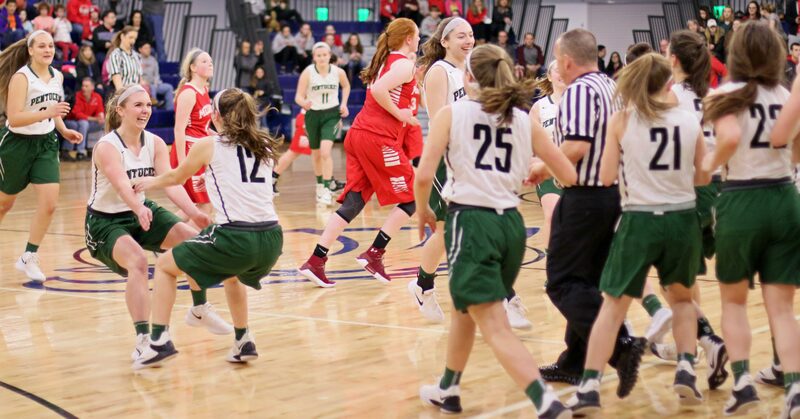 Alexis Doherty and Lily Cunningham drained three’s and Sam Dewey hit a free throw. Suddenly that “comfortable” lead was once again a one-possession lead with three minutes left. As I said at the start, Pentucket finished strong. In the final stretch they controlled the ball without any turnovers and forced Melrose to foul by constantly going to the basket. 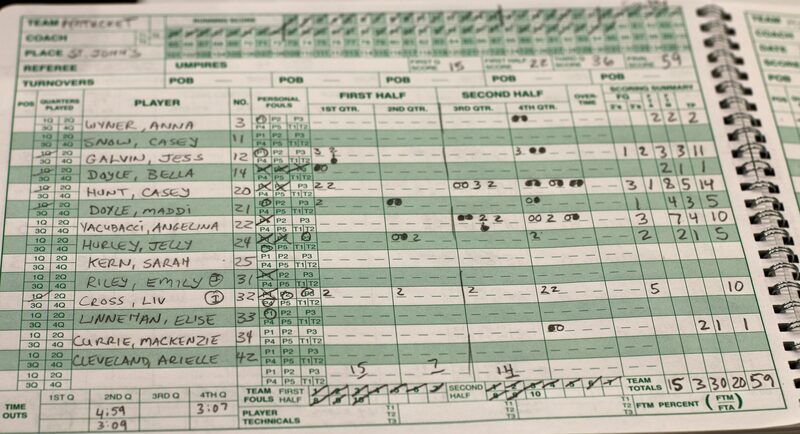 The Sachems late-game foul shooting was a very good eleven-for-fourteen. 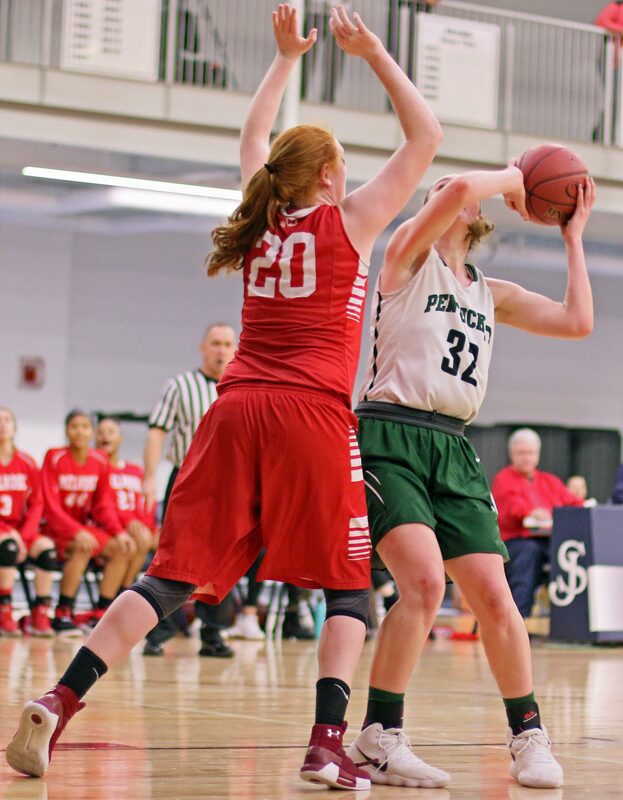 There was also a Jess Galvin (11 points) layup set up by Casey Hunt (14 points). 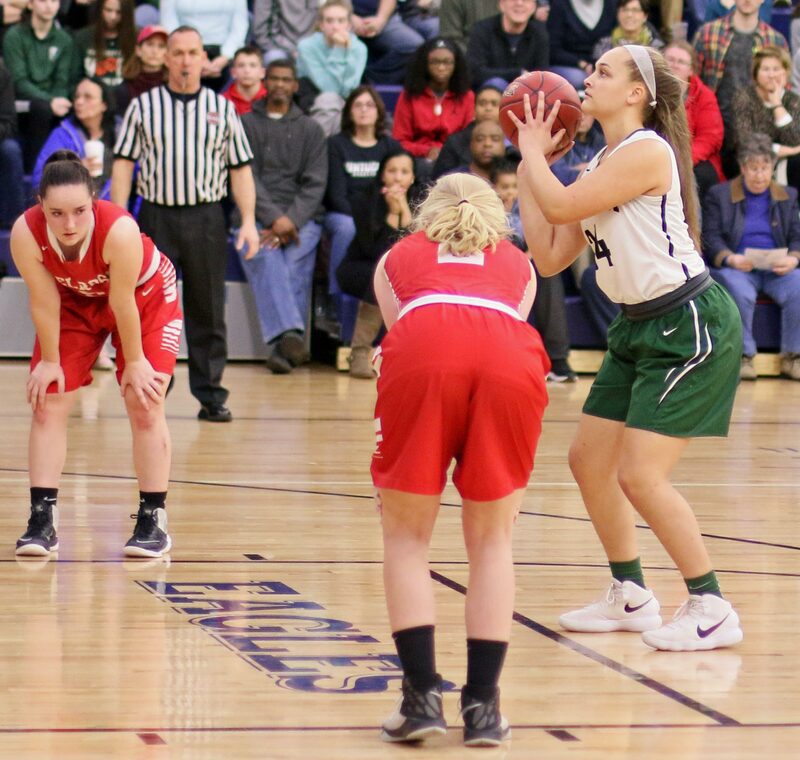 The Lady Raiders could get just two free throws (Alexis Doherty) in those outcome-deciding final three minutes. That Sachems’ defense created a whopping thirty-two turnovers including six during the fast start and four during the strong finish. 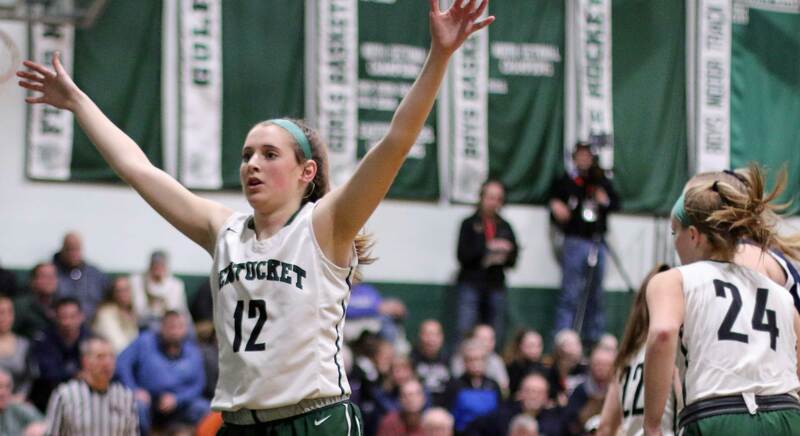 The Lady Raiders were at their best when they turned Pentucket misses into fast breaks. 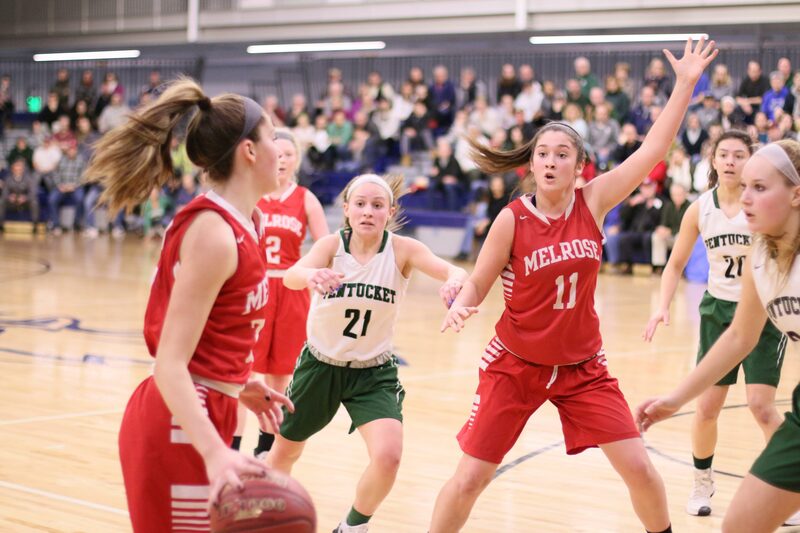 Lily Cunningham went the distance several times for Melrose. “They were a good team,” said junior Liv Cross afterwards. I arrived early and wondered where everyone was. Of course, I was at the old gym. 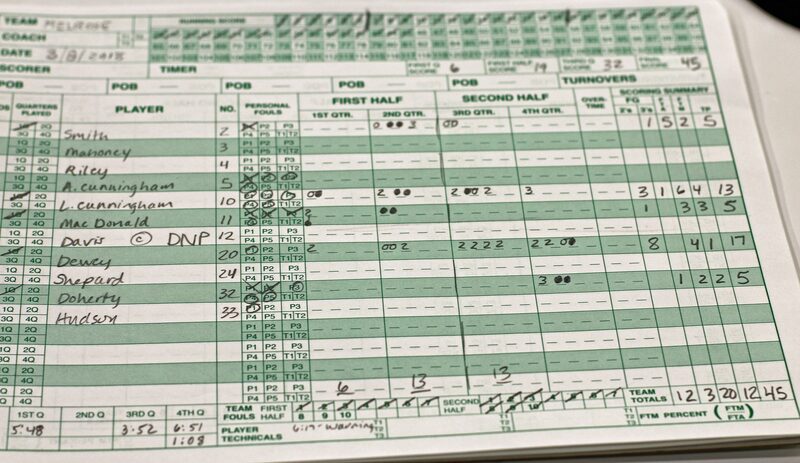 I told Coach McNamara about my mistake before the game and he said that he liked that old gym because Pentucket had never lost there. The new gym is very nice. The old one had one scoreboard. This one has several. I am not a fan of seats in the end zones but overall, I liked it. Melrose’s last win over Wakefield gave them the Middlesex League Freedom Division title for the first time in ten years.